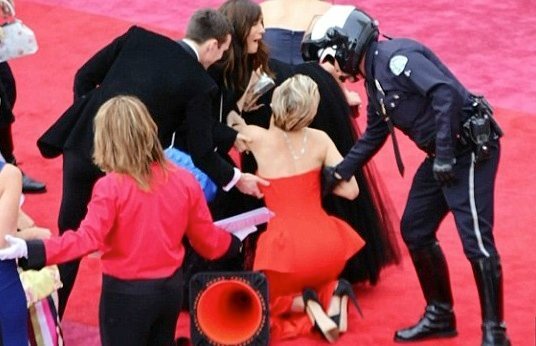 Best Supporting Actress nominee Jennifer Lawrence took a tumble as she made her way down the Oscar red carpet. Just like last year during the Academy Awards, Jennifer Lawrence, 23, lost her footing while waving to the crowds assembled at the Dolby Theatre, before grabbing at her entourage for help as she hit the deck. The actress was helped up to her feet by boyfriend Nicholas Hoult laughing and joking. Jennifer Lawrence, nominated this year for Best Supporting Actress for her role in American Hustle, then turned to the applauding crowd and took a bow.